In hollows to the east and west of Windmill Lane stood what were once sandpits. The Folkestone beds of loose, yellow sand run through the centre of the village, and the sandpit was worked, i.e. dug out, by hand starting in the late 19th century. Sandpit House now stands near the western site. The pit was worked out by the 1930s. The map of this pit on the left is from 1946/52. The photographs listed below are of the hollow on the west side of Windmill Lane, which may have originally been part of a sand digging. In later years, there was a chicken hatching farm on the site, owned by a Mr. Martin, and the brick foundations of the sheds can still be seen. He closed up the farm when the railway closed in 1964 as the chickens could no longer be transported by rail. Today the sandpit is an empty and slightly eerie piece of land populated by clumps of trees and a floor of leaves and chippings. The map on the right is from 1897. Sandpit: You can see Windmill Lane running along the top of this 1930s photo, above the pit. The white house on the left is Rosemount. Sandpit 1: This is the view from the floor of the sandpit after descending the steps to it from Windmill Lane. A garage wall in the lane can be seen in the top right of the picture. Pictures from Easter 2016. Sandpit 2-4: Some general views along the sandpit clearing, showing the brick outlines of the old turkey sheds here and there. 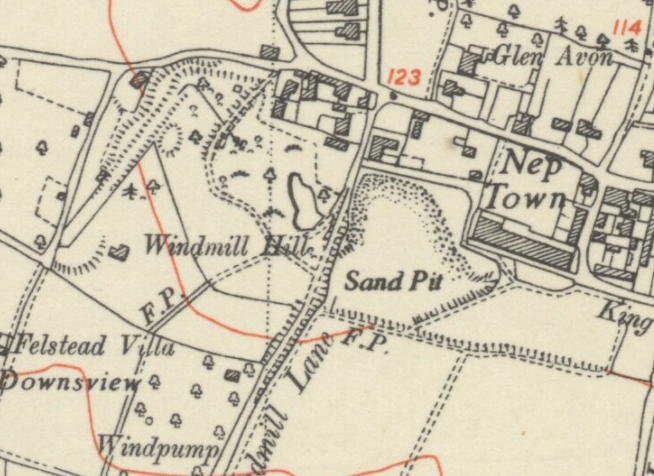 Sandpit 5: There's a steep fall in land height from the top of Windmill Lane to the bottom of Sandy Lane. The first drop is from Windmill Lane to the sandpit floot, and this photo shows the other end of the sandpit looking down through a chain link fence to another drop down to Sandy Lane. Sandpit 6: The remains of some barbecue or party or similar gathering on the base of one of the sheds. Sandpit 7: Halfway down Windmill Lane there is a gate to the sandpit. You can see the extent of the slope of the lane by comparing it with the view in Sandpit 1. 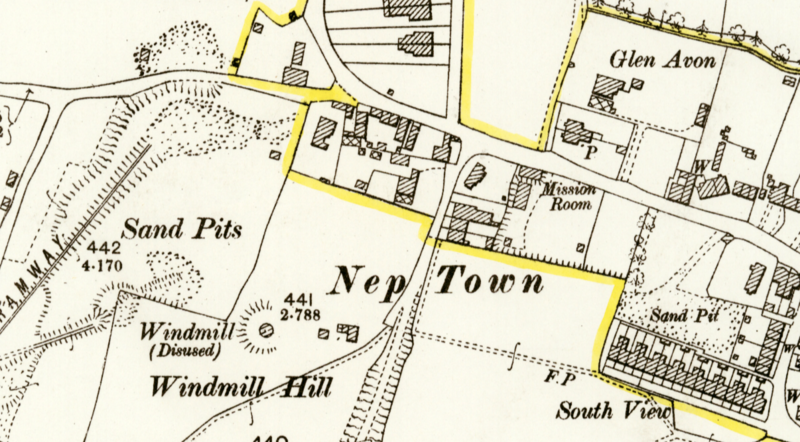 Sandpit tramway: This is a portion of the OS 25" 1900 map of Henfield, and shows the tramway that connected the sandpit to the main railway. Sandpit: A photo from late March 2017, showing a bank of daffodils at the side of Windmill Lane, with the sandpit below.